Students attempting to text in class might be the bane of teachers everywhere, but even the most jaded luddite would have to admit: Tablets and smartphones in the classroom bring a number of advantages too. From greater student engagement to an expansion of the learning environment beyond normal school hours, gadgets can open new educational doors. But hardware is only part of the puzzle. You also need the right software to spool up those eager young minds. That’s where these come in. From creating lesson plans and keeping attendance, to behavior records and communicating with students outside the classroom, these apps let teachers harness tech instead of fighting it. Knowing, it turns out, really is half the battle. Teachers love to turn a boring lesson into a game to motivate their students, but not everyone has the skills to make a game from scratch. Thankfully, the GetKahoot website makes it easy to turn your class into a gameshow. All you have to do is enter your prepared questions and answers into the site to create an instantly playable game with a web browser. Your students can then download the Kahoot app to use as a buzzer to join in on the fun. Parents want to celebrate their kids’ achievements every step of the way, so it’s important to keep them in the loop on their kids’ progress throughout the school year. With Seesaw, a student portfolio app, students can store and post their best work to share with their parents. Teachers, on the other hand, can provide concrete examples of their students’ strengths and weaknesses to their parents during teacher-parent meetings. If your school already uses the G Suite for Education (formerly known as Google Apps for Education), chances are you already know about Classroom. Not only can you distribute and grade assignments through the app, as well as organize all class materials on Google Drive, you can also reach your students more easily — either to make announcements or to engage them in discussions. Don’t you wish you could meet other teachers who teach the same subject or grade as you, even if they don’t work at your school? Teach Learn Lead is like Facebook for teachers, where you can meet like-minded colleagues who may be anywhere in the country, but have relevant experience to share. You can start discussions and polls to share lesson plan ideas or career advice, or just gab about your students. Remind (formerly known as Remind 101) makes it easy for teachers to communicate with students and their parents beyond the classroom. 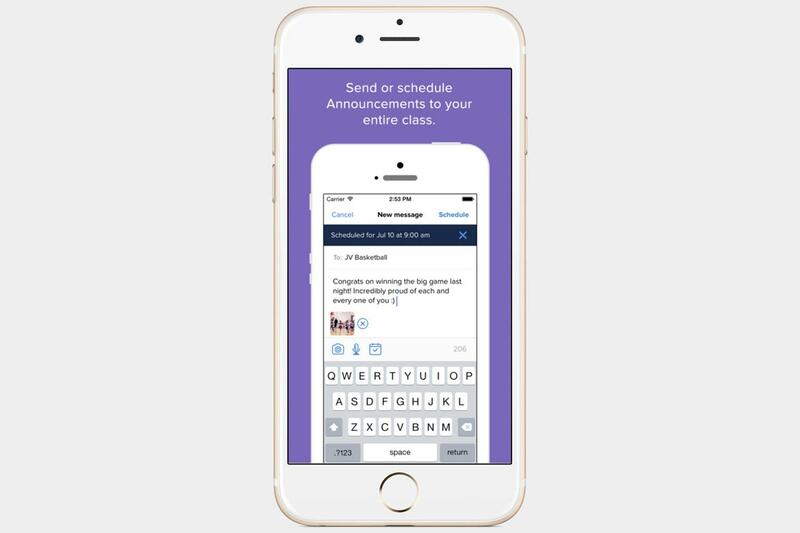 You can make class announcements, group chats, or contact individuals privately through the app. Your messages can even be translated into over 70 languages, making it possible to communicate with parents who are non-native English speakers. Collecting those pesky parental consent forms from your students for field trips can be a nightmare, but Classtree makes the process painless and paperless. Unlike Remind, which simply notifies parents of the logistics of an upcoming field trip, Classtree actually lets you attach a consent form for parents to e-sign to go along with the announcement. The app even shows you exactly who has seen your note and who owes you a signed form. It’s not just businesses that rely on Slack to keep employees connected: Professors and college students are increasingly turning to the messaging tool to stay in touch beyond school hours. Not only are some instructors hosting text-based “office hours” on the platform, they are even pushing important reminders through the app to their students, just in case. There is a better way of keeping attendance, grades, and class notes than in easily misplaced notebooks or on random pieces of paper. As a digital gradebook and classroom management app, Additio lets you take attendance, calculate grades, and plan your timetable, all on your mobile device. For additional features, like performance analytics and note-keeping, you need to opt for the $8-per-month Plus edition. Taking advantage of the iPad’s touchscreen and portability, the Doceri app turns the mobile device into a portable interactive whiteboard. You can annotate whatever material you have on-screen as you teach, which makes for a more interactive lesson. Besides letting you handwrite complicated math equations or brainstorm Venn diagrams on the fly, the app can also record the class and post it online directly from your iPad. Elementary school teachers are always on the lookout for new books for their students, but worry about spending too much of their own money for their classrooms. With the aptly-named Epic Unlimited Books for Kids app, teachers in America and Canada get free access to over 15,000 kid-friendly books ranging from National Geographic Kids to the Goosebumps series. The Educator’s version also includes lesson ideas and videos to make life easier for teachers.